We have noticed that due to the recent colossal influx of cloud based apps in software arena, many image editors and viewers are either totally drifting away from the core image organizing and editing features which a common user likes to see, or have started capitalizing on everything, from online image sharing to social media components integration with long winded configuration process to go around with. That’s the reason why so many eminent image viewers and editors are being cascaded down the popularity graph. So, what makes an image editing software stand out from the rest? I am not an advocate of outright simplicity but when it comes to choosing a good software which while offering all important features to catch up with fast track online image sharing blaze, also provides features to enhance image viewing and editing experience, only one springs readily to my mind, and that is, Picasa. Whether you want to brush up on your image editing skills, share photos with your friends and family, or simply like to enjoy an awesome image viewer on your desktop with web sync, Picasa is arguably the most viable option you can opt in for. In this post, we will try to delve deep into its most underrated features. Want to create a quick movie with your favorite music track playing in the background using a bunch of photos? Picasa Movie Maker can render assistance to you. Contrasting to other movie makers, it takes nothing more than a few minutes to specify the photo set you want to include followed by inserting music track, tinkering around with different slide transitions, overlying text, changing text color and background, before uploading it to YouTube. Creating an index page of all the pictures or an image collage is easy. Picasa Collage creator has a handful of exclusive features which are offered by only paid collage creators. The customizable color filling option enhances the overall look of the collage. You can give it a solid color or decorate the fill by using main/centered image color shades. Since you may need to create collage to not only view them on monitors, but on big multimedia screens and and HDTVs as well, Picasa presents a range of collage sizes, so you won’t have to manually resize the images to fit the screen. What will actually intrude your attention is the set of collage layouts it has to offer. Apart from heavy superimposition layout, which gives awesome abstract-art look to your pictures provided you have selected all the images very discreetly, it has 5 exquisite layouts which can be applied without having to rearrange the images or defining numbers of photos to set in one row or column. The ubiquitous indexing feature of Picasa is both loathed and lauded by users. It comes useful for those who want to create an amalgamate of all the images, including, small, large, high and low resolution images present in the system but it often takes forever to index all of them. Photography buffs tend to hate this because it’s a laborious task to remove image folders manually from Picasa Folder Manager. One of the most overlooked Picasa feature which offers panacea for such problems is Remove Low Quality Pictures. Picasa, despite being an effective photo quality identifier, lets you quickly remove all low quality images from your indexed image stack with a single click, making it easier to list down only HQ images. Before printing any image, click Review to analyze the quality of image in question. In Review for Printing dialog box, you have option to either remove the selected picture or remove all the low quality Pictures. Users with humongous photo collection often find themselves in labyrinth of image files scattered in different locations. With Picasa installed on the system, it not only becomes fairly simple to track a specific photoset by date, size, and by many other Picasa’s native attributes, but also to streamline all the saved images within no time. Apart from managing images in customizable categories and tags, the Timeline feature saves a significant amount of time for searching photosets by date; month and year. Once indexed, it doesn’t take a lot of time to put your photo-sets in timeline. Right from the first image you saved on your system till the most recent addition, you can get a quick overview of all photo albums and run slideshow of selected ones without having to endure few clicks to manually find it from folder navigation bar. Picasa built-in faces search filter has truly changed the way we find people from an image library. The face-matching techniques deployed within Picasa search make it extremely easy to find people by their names. Using this technique, you can tag people by their names, so you can quickly search them later. Moreover, it not only just tag the photos but also remember the tagged faces. This automates the process of tagging pictures without having to tag same person’s face each time by his/her name. After Picasa has finished indexing all of your images, from People collection, select Unnamed People. It will show all the unnamed faces in your collection which are yet to be tagged. Just enter the name of the person in the box present underneath his/her face to let Picasa always remember tagged face. In similar fashion, you can tag each unnamed face. Picasa creates a separate album for each tagged face, making it ingeniously easy to find your friends, family members and other people by their names. Most photography enthusiasts love to analyze photos using different aspects, such as, by different shades used, by angles & color intensity, by natural image sharpness, etc., and what could be more interesting than to apply color-specific filters over an album. 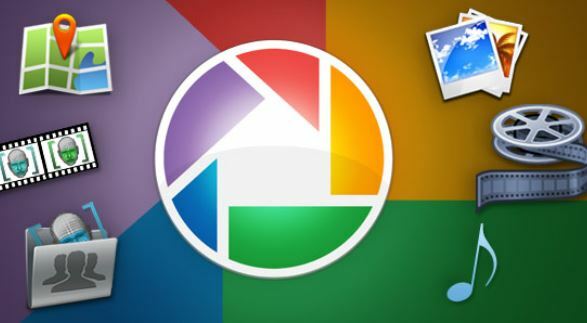 Apart from face recognition filters, Picasa has the ability to search different colors used in your photo collection. You can for instance view all the black & white images out of your collection or apply other condition with this search behavior to further narrow down the results. You can either apply color filter from Tools –> Experimental menu or just enter color: followed by color name to filter currently opened gallery. What would be the best way to enjoy an image slideshow? Apart from the your favorite snapshots, a good background music gives a slideshow exactly what it needs. Many of you might have already specified the music folder from Options –> Slideshow, to play the tracks randomly when slideshow is running on your screen, but what about associating a track with each saved album? In Picasa, you can easily specify a music track with each album according to the theme of underlying images. You just have to right-click the album folder present in navigation bar, and select Edit Folder Description, enable Music checkbox and select the track you want to listen to with slideshow of selected album. HTML publishing is not the hidden feature of Picasa. Many users embed HTML based photo album gallery in their websites after tweaking with published HTML elements. But direct uploading is something which repels many novice users, as it requires some extra FTP server related details to be specified prior to uploading. Publishing photo albums via FTP is easy as piece of cake and takes only a few minutes to configure. Picasa natively offers an easy to use FTP account manager which can hold multiple FTP server info, so that you can quickly upload and publish HTML based galleries to your websites. First off, select Publish via FTP from Experimental menu, choose the layout, export it and then add a FTP account. It requires you to enter FTP domain, FTP Root, username and password for direct publishing. The first step after importing snapshots from your digital camera is to streamline orientation of the images. Changing landscape to portrait and vice versa is a one click process, but when thousands of images are to be processed, it becomes a pretty tiring task. In such times, when large editing is required, Picasa built-in Batch Edit feature come useful. Batch editing is provided by many image editors out there, but Picasa batch edit features outweighs them all. Apart from renaming and applying clockwise and counter-clockwise rotation over images in bulk, it also allows fixing red eye effect, sharpening images to defined level, and adjusting color and contrast of images in one go. Face Movie is one terrific latest addition to Picasa. Using all the features of Picasa Movie Maker, it takes a novel approach to create movies by keeping the face of person aligned all the time during transitions. The best part is that you wont need to manually mark the face area of the person. Picasa, by using faces filter, identifies all face areas in selected photos, allowing you to create a face movie with a single click. Want to share, lets say, birthday snaps with your friends and family? Why not make them a CD having all of your favorite birthday pictures on it. Picasa Gift CD feature is out to simplify the process of writing images to disc. Just select the snaps from album, under Create menu, select Create a Gift CD, specify image size followed by disc name, and finally click Burn to write the selected album(s) to CD. With direct Google Map integration, Picasa makes it easy for users to annotate favorite places with images saved in their system. Google Maps bar lets you search the place which is to be marked. Once you get to the place, select the image from the album, click annotator on Google Maps, and finally click the place to annotate it with your image. Looking at the slew of features that Picasa has to offer, suffice to say it’s one of the smartest image editor out there. We’ve tried to cover most overlooked yet brilliant features, and may have missed out on many. If you’re using any hidden feature which should’ve been included in the list, drop it off in the comments section below.